The following is a guide for properly addressing Orthodox clergy. 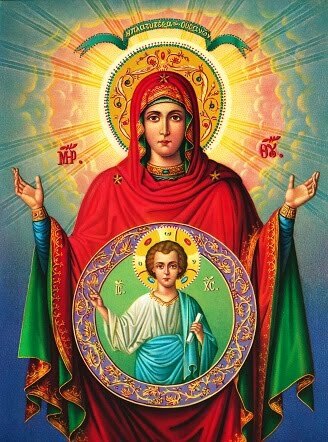 Most of the titles do not exactly correspond to the terms used in Greek, Russian, or the other native languages of the national Orthodox Churches, but they have been widely accepted as standard English usages. When we address Deacons or Priests, we should use the title "Father." Bishops we should address as "Your Grace." Though all Bishops (including Patriarchs) are equal in the Orthodox Church, they do have different administrative duties and honors that accrue to their rank in this sense. Thus, "Your Eminence" is the proper title for Bishops with suffragans or assistant Bishops, Metropolitans, and most Archbishops (among the exceptions to this rule is the Archbishop of Athens, who is addressed as "Your Beatitude"). 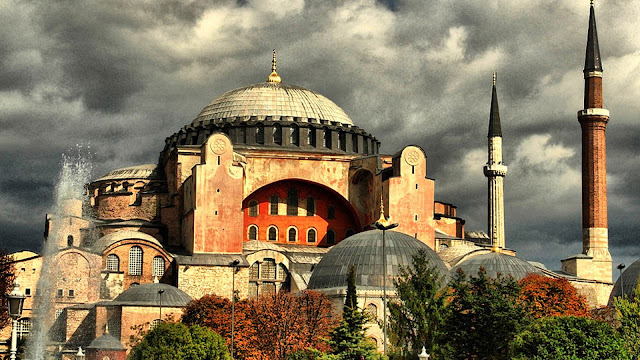 "Your Beatitude" is the proper title for Patriarchs (except for the Œcumenical Patriarch in Constantinople, who is addressed as "Your All—Holiness"). When we approach an Orthodox Presbyter or Bishop (but not a Deacon), we make a bow by reaching down and touching the floor with our right hand, place our right hand over the left (palms upward), and say: "Bless, Father" (or "Bless, Your Grace," or "Bless, Your Eminence," etc.). The Priest or Bishop then answers, "May the Lord bless you," blesses us with the Sign of the Cross, and places his right hand in our hands. We kiss then his hand. 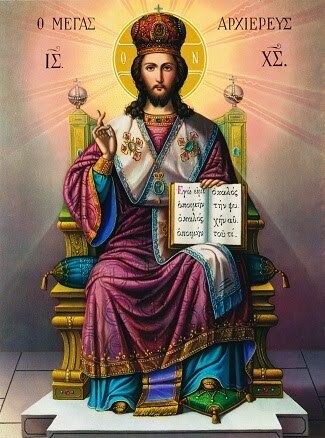 We should understand that when the Priest or Bishop blesses us, he forms his fingers to represent the Christogram "ICXC" a traditional abbreviation of the Greek words for "Jesus Christ" (i.e., the first and last letters of each of the words "IHCOYC XRICTOC"). Thus, the Priest's blessing is in the Name of Christ, as he emphasizes in his response to the believer's request for a blessing. Other responses to this request are used by many clergy, but the antiquity and symbolism of the tradition which we have presented are compelling arguments for its use. We should also note that the reason that a lay person kisses the hand of a Priest or Bishop is to show respect to his Apostolic office. More importantly, however, since both hold the Holy Mysteries in their hands during the Divine Liturgy, we show respect to the Holy Eucharist when we kiss their hands. In fact, Saint John Chrysostomos once said that if one were to meet an Orthodox Priest walking along with an Angel, that he should greet the Priest first and kiss his hand, since that hand has touched the Body and Blood of our Lord. For this latter reason, we do not normally kiss the hand of a Deacon. 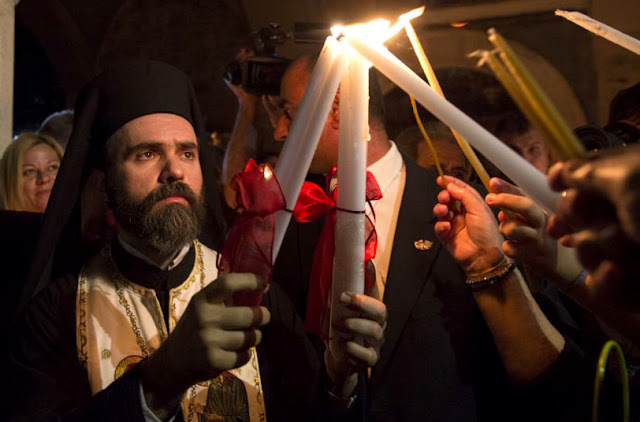 While a Deacon in the Orthodox Church holds the first level of the Priesthood (Deacon, Presbyter, Bishop), his service does not entail blessing the Mysteries. When we take leave of a Priest or Bishop, we should again ask for a blessing, just as we did when we first greeted him. The wife of a Deacon is called "Diakonissa [Thee—a—kó—nees—sa]" in Greek. The Slavic Churches commonly use the same title for the wife of a Deacon as they do for the wife of a Priest. In any case, the wife of a Priest should normally be addressed with both her title and her name in informal situations (e.g., "Presbytera Mary," "Diakonissa Sophia," etc.). Whenever you speak to Orthodox clergy of Priestly rank on the telephone, you should always begin your conversation by asking for a blessing: "Father, bless." When speaking with a Bishop, you should say "Bless, Despota [Thés—po—ta]" (or "Vladika [Vlá—dee—ka]" in Slavonic, "Master" in English). It is also appropriate to say, "Bless, Your Grace" (or "Your Eminence," etc.). You should end your conversation by asking for a blessing again. When we write to a clergyman (and, by custom, monastics), we should open our letter with the greeting, "Bless, Father." At the end of the letter, it is customary to close with the following line: "Kissing your right hand...." It is not appropriate to invoke a blessing on a clergyman, as many do: "May God bless you." Not only does this show a certain spiritual arrogance before the image of the cleric, but laymen do not have the Grace of the Priesthood and the prerogative to bless in their stead. Even a Priest properly introduces his letters with the words, "The blessing of the Lord" or "May God bless you," rather than offering his own blessing. Though he can do the latter, humility prevails in his behavior, too. Needless to say, when a clergyman writes to his ecclesiastical superior, he should ask for a blessing and not bestow one. Deacons in the Orthodox Church are addressed as "The Reverend Deacon," if they are married Deacons. If they are Deacons who are also monks, they are addressed as "The Reverend Hierodeacon." If a Deacon holds the honor of Archdeacon or Protodeacon, he is addressed as "The Reverend Archdeacon" or "The Reverend Protodeacon." Deacons hold a rank in the Priesthood and are, therefore, not laymen. This is an important point to remember, since so many Orthodox here in America have come to think of the Deacon as a kind of "quasi—Priest." This is the result of Latin influence and poor teaching. As members of the Priesthood, Deacons must be addressed, as we noted above, as "Father" (or "Deacon Father"). Orthodox Priests are addressed as "The Reverend Father," if they are married Priests. 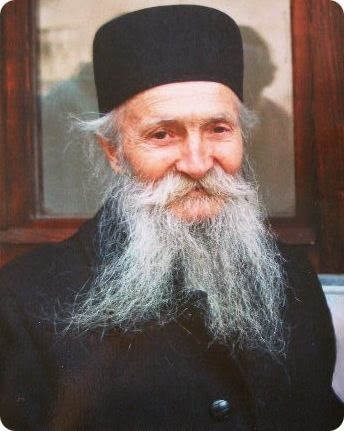 If they are Hieromonks (monks who are also Priests), they are addressed as "The Reverend Hieromonk." Priests with special honors are addressed in this manner: an Archimandrite (the highest monastic rank below that of Bishop), "The Very Reverend Archimandrite" (or, in the Slavic jurisdictions, "The Right Reverend Archimandrite"); and Proto-presbyters, "The Very Reverend Protopresbyter." In personal address, as we noted above, all Priests are called "Father," usually followed by their first names (e.g., "Father John"). Bishops in the Orthodox Church are addressed as "The Right Reverend Bishop," followed by their first name (e.g., "The Right Reverend Bishop John"). Archbishops, Metropolitans, and Patriarchs are addressed as "The Most Reverend Archbishop" ("Metropolitan," or "Patriarch"). Because they are also monastics, all ranks of Archpastors (Bishops, Archbishops, Metropolitans, or Patriarchs) are addressed by their first names or first names and sees (e.g., "Bishop John of San Francisco"). It is not correct to use the family name of a Bishop—or any monastic for that matter. Though many monastics and Bishops use their family names, even in Orthodox countries like Russia and Greece, this is absolutely improper and a violation of an ancient Church custom. All male monastics in the Orthodox Church are called "Father," whether they hold the Priesthood or not, and are formally addressed as "Monk (name)," if they do not have a Priestly rank. If they are of Priestly rank, they are formally addressed as "Hieromonk" or "Hierodeacon" (see above). Monastics are some-times addressed according to their monastic rank; for example, "Rasophore—monk (name)," "Stavrophore—monk (name)," or "Schemamonk (name)." The Abbot of a monastery is addressed as "The Very Reverend Abbot," whether he holds Priestly rank or not and whether or not he is an Archimandrite by rank. Under no circumstances whatsoever is an Orthodox monk addressed by laymen as "Brother." This is a Latin custom. 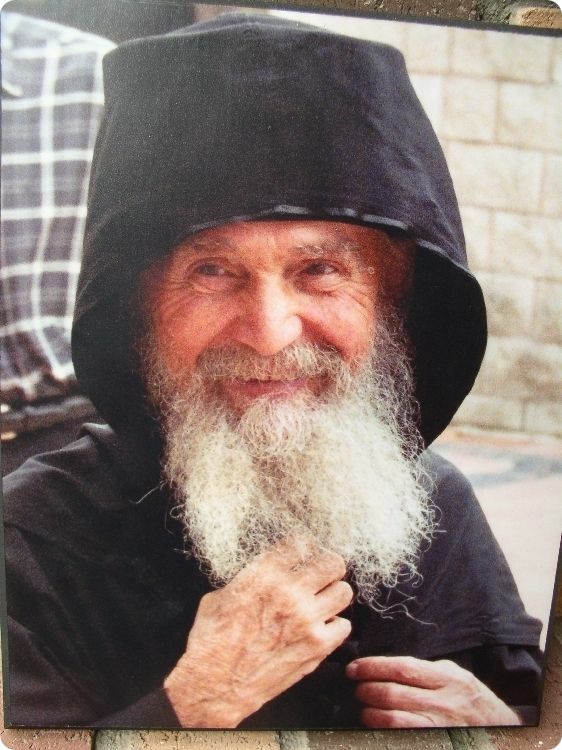 The term "Brother" is used in Orthodox monasteries in two instances only: first, to designate beginners in the monastic life (novices or, in Greek, dokimoi ["those being tested"]), who are given a blessing, in the strictest tradition, to wear only the inner cassock and a monastic cap; and second, as an occasional, informal form of address between monastics themselves (including Bishops). The titles which we have used for male monastics also apply to female monastics. 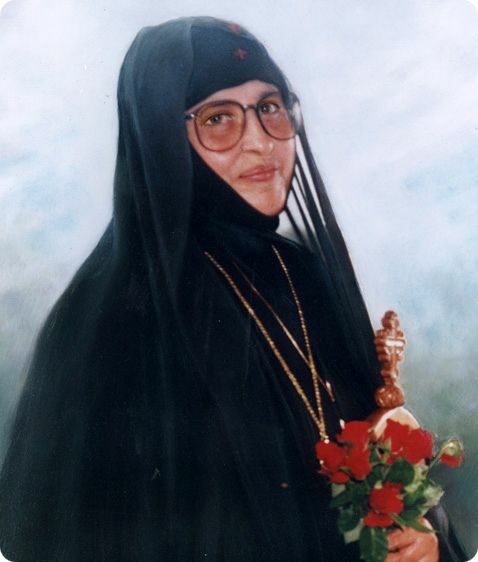 In fact, a community of female monastics is often called a "monastery" rather than a convent (though there is nothing improper, as some wrongly claim, in calling a monastery for women a "convent"), just as the word "convent," in its strictest meaning, can apply to a monastic community of males, too. Women monastics are formally addressed as "Nun (name)" or "Rasophore—nun (name)," etc., and the Abbess of a convent is addressed as "The Very Reverend Abbess." 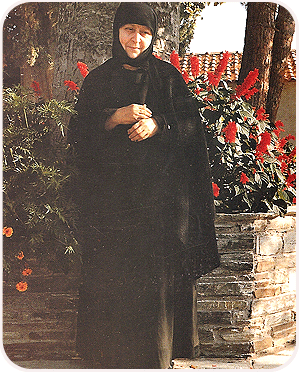 Though traditions for informal address vary, in most places, Rasophore nuns are called "Sister," while any monastic above the rank of Rasophore is called "Mother." Novices are addressed as "Sister." There are, as we have noted, some differences in the way that Orthodox religious are addressed. What we have given above corresponds to a reasonably standardized vocabulary as one would find it in more traditional English—language Orthodox writings and among English—speaking Orthodox monastics. 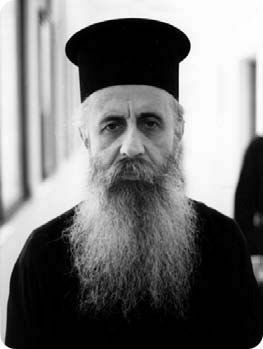 The influx of Latin converts into Orthodox monasticism and the phenomenon of "monasticism by convenient rule, instant tradition, and fabrication," as Archbishop Chrysostomos of Etna has called it, are things that have also led to great confusion in the use of English terminology that corresponds more correctly to the vocabulary of traditional Orthodox monastics. From Father David Cownie and Presbytera Juliana Cownie, A Guide to Orthodox Life (Etna, CA: Center for Traditionalist Orthodox Studies, 1996), pp. 90-96. Is there a proper way to address and sign letters to clergy/fellow Orthodox? When one writes a clergyman, he should begin his letter in this way: "Bless!" or "I ask for your blessing." The letter may be signed: "In Christ," "Asking for your prayers," etc. Lay people should refrain from blessing a Priest (i.e., "God bless you"), and Priests should greet each other with a simple request for a blessing. Lay people may greet each other with a simple request for prayers and close their letters in the same way. The flowery exhortations that were especially popular in the nineteenth-century Russian Church ("Christ is in our midst," "Glory be to God," inter alia), and usually taken from the Liturgy, are not traditional forms of greeting for clergy or for lay people. Nor are the greetings exchanged between great Church Fathers and the Saints. Though these high-sounding exhortations are very popular now, since they appeal to the Protestant evangelical piety which has invaded the Church, when used by the poor Christians that we are today, they are at odds with the humility which derives from a piety engendered by submission to Christ and to the traditions of His Church. Orthodox Tradition, Vol. IX, No. 1, pp. 10-11.